This semi-precious gemstone is the leader in its category and the first option for those considering a color gemstone for their engagement ring. Color: Morganites are typically a light pink to a peachy hue, though they also come in lighter violet-pink shades as well. The depth of color in these stones is related to how they are cut, as the more concentrated the color is in the stone, the more valuable the Morganite is. Setting the Morganite in rose gold is particularly great for showcasing its color. Cut: Morganites should have clear, distinctive facets that enhance the depth of the color. Some are cut with a "checkerboard' style faceting. This is not ideal for even light distribution. You can, however, find Morganites in just about every shape with the most popular being cushion, oval, pear and round. Clarity: Morganites typically don't show visible inclusions. However, you can damage the surface of the stone by scratching, scraping or chipping the stone. Carat Weight: Morganites originate from larger crystals. They are more attractive when cut with larger facets as larger Morganites will show increased color compared to small ones. Durability: Certainly not as strong as a diamond, these gemstones must be worn with more care. Avoid any activities that may cause the stone to come into direct contact with another surface. 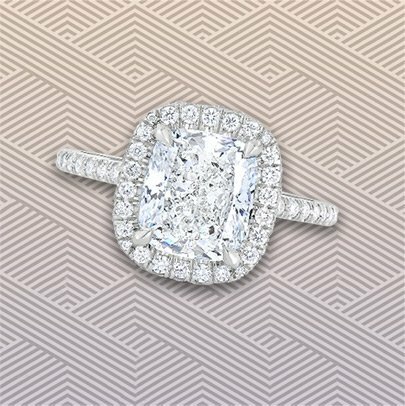 Because these stones are less expensive than diamonds, re-cutting them after it has been chipped, or replacing the stone altogether can be a consideration.